Wisconsin is home to one of the nation’s largest populations. 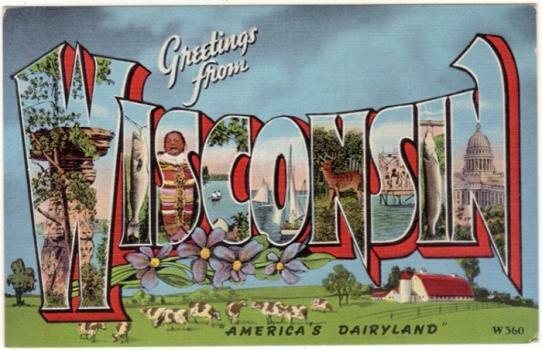 With nearly 5.8 million residents, the Badger State is the nation’s 20th largest state. It is home to nearly 34,000 salaried artists and designers and one of the largest collections of art venues in the region. In the state’s largest city, Milwaukee, you will find top art museums such as Milwaukee Art Museum (MAM), Charles Allis Art Museum, Haggerty Museum of Art at Marquette University, and Villa Terrace Decorative Arts Museum. Madison—the state’s second largest city, is home to the Madison Museum of Contemporary Art (MMoCA) and Chazen Museum of Art at University of Wisconsin. Head to Green Bay—the state’s third largest city, where you’ll find the Neville Public Museum and the ARTgarage, which houses exhibits, classes, performances, and a variety of special events. Visitors to Kenosha, a popular tourist destination and Wisconsin’s fourth largest city, can explore the Kenosha Public Museum or Anderson Arts Center, which is housed in a 9,000 square foot mansion. Finally, in Racine, the state’s fifth largest city, you will find more than 10,000 square feet of space at the Racine Art Museum (RAM) and Artists Gallery—an artist cooperative of 40 regional artists that has been run and managed by artists since 1998. Wisconsin is also home to a wide variety of creative agencies and studios, as well as a large collection of top-rated art and design schools. Many are located in Milwaukee. Just a few top agencies and studios include Hanson Dodge Creative, Media Dynamics, Lakeland Creative (Milwaukee, Chicago, Green Bay), Taylor Studios, Boelter & Lincoln, Jigsaw Creative, Laughlin Constable (Milwaukee, Chicago, New York), Cramer and Krasselt, Fullhouse, Scott Advertising, Zizzo Group, and Platypus Advertising & Design (Pewaukee—around 20 miles from Milwaukee). Some of the state’s best art and design schools include Peck School of the Arts at the University of Milwaukee-Wisconsin, Milwaukee Institute of Art & Design (MIAD), Viterbo University, and Carroll University. Wisconsin is home 84 Title IV degree-granting colleges and universities. Many offer programs for aspiring artists and designers—including graphic designers. Scroll through the list below to review Wisconsin’s best schools for aspiring graphic designers and what they have to offer. Wisconsin is home to 33,740 professionals working in Arts, Design, Entertainment, Sports, and Media (ADESM) occupations. An impressive 4,750 of these artists are graphic designers. They average $45,810 per year, up from $42,460 in 2013 when the state was home to 4,530 graphic designers. The state is home to two of the top ten metropolitan areas with the highest concentration of jobs and location quotients. They are 'Madison, WI' and 'Racine, WI'. While graphic designers may find employment opportunities in a number of Wisconsin cities and towns, a greater number of prospects can be found in major cities such Milwaukee, Madison, Green Bay, Kenosha, and Racine.